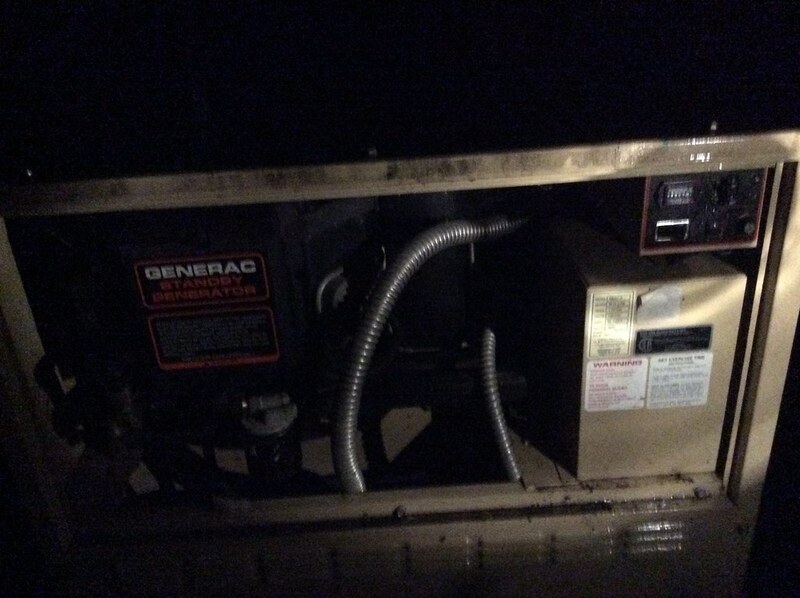 The power went out today, as expected (it goes out in almost every good storm), but, what was unexpected was that the Generac 8KW generator didn't kick in. 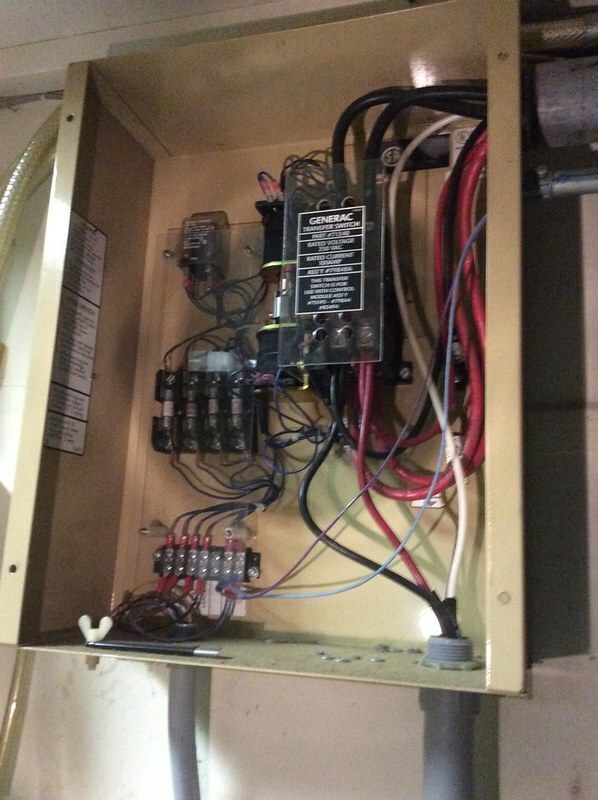 I had to manually flip the power switch a few times, from auto to manual to off and back (even though it was on auto all the time and the battery was charged as evidenced by a 3.8VDC check on the side panel) and there is plenty of propane in the 500 gallon propane tank. I flipped the breaker a few times. I pulled the fuse and it looked good. Everything looked ok electrically, and, after a few flips of the switch, it turned on. Recently on its weekly charging cycle, it had been turning off and on after only a few seconds, so, that's probably related. 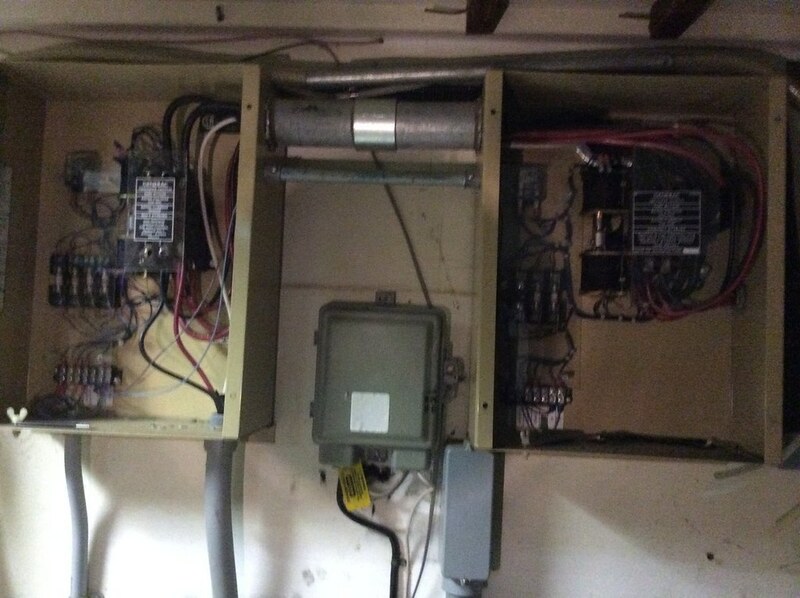 While the Generac not starting is one problem, the other oddity was that, once started, and seemingly running full force, the transfer switch(s) inside the garage were clicking for about five or ten minutes and then stopped clicking. I opened the panels, but by the time I opened them, the clicking had stopped. 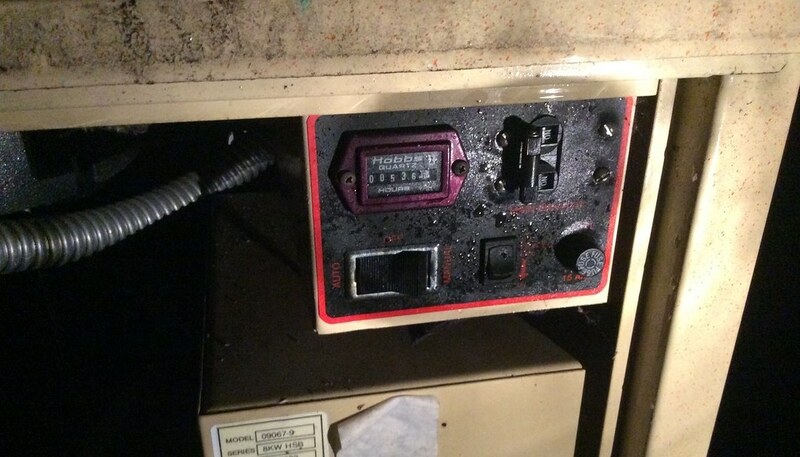 I'm guessing that the propane generator wasn't up to speed at first, for whatever reason, and that the voltage wasn't as high as it needed to keep the solenoids down, so, they were clicking? But I never heard that clicking before, and, the lights were running as soon as the generator kicked in. What was going on with the power to the house while this clicking was going on? Lights going on and off? It's possible it's RPM related. They have control electronics that presumably look for certain conditions to be present, eg correct voltage, before putting it online. I guess that answers the question about the lights, sounds like they were on the whole time. Any possibility the utility power was intermittent, coming back sporadically? If what you were hearing was the main power relay's moving, I don't see how you could have clicking and uninterrupted lights. 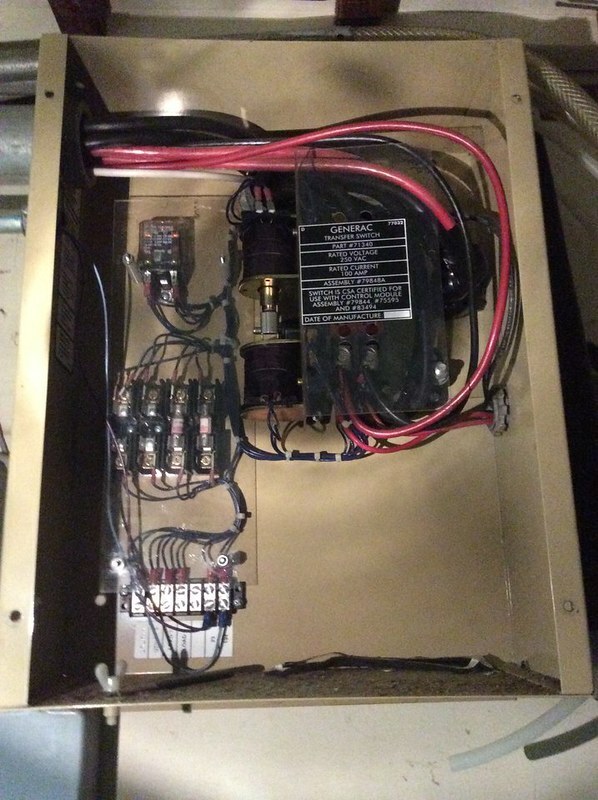 For what it's worth, I did some digging into about a 5 year old Generac that I got for free, to try to resurrect it. The company that had sold/installed it said it was shot and not worth fixing. This was just used for house standby here where the power rarely goes out for more than 15 mins. After I read the many horror stories on reviews at Amazon, I concluded that I wouldn't buy one, wouldn't rely on one, and that it wasn't worth putting the money into the free one. At a minimum, the rotor was shot, possibly the stator too. So, if I had one that's going, I'd put some money into it, but before I put a lot into it, I'd go look at those reviews. 1) Start with the basics. Change the oil, make sure the unit is clean and free of dust and debris. 2) Look for online forums. And read any paper work you have with the machine. Might be able to get the manual from the web site in pdf. When my Mom's garage door opener didn't work right, I found the manual Dad had tucked in behind. Sure enough, that had the trouble shooting and helped me to fix the problem. I was in the garage that whole time, and the fluorescent lights in the garage were not flickering. The PG&E power "could" have been intermittent (how would I have known?). I swear by that thing! You have to remember that, here in California, up in the hills, our power goes out five or six times a year. Interestingly, we *thought* it was getting better, in that, during the drought, the power stayed on for months before going out; but, it has gone out thrice in as many months. Sometimes we're out for days (the most I've seen is 3 days); but, most of the time it's only for a half dozen hours. In this case, the power came on during the night, as it's still dark outside, but I see lights on the neighbors' houses who don't have generators and I opened a window and I don't hear my generator. Normally, I can hear mine (but nobody elses' since mine is loud); and I can see which neighbors have lights and which don't (during the night). But last night, I could hear the neighbor's generator, because mine wasn't running. I've never changed the oil, but I doubt that's the problem, but it's a great idea nonetheless. I'll also take the battery down to Autozone to have load tested. It had 536.something hours on the clock when I snapped that picture of the front panel in the night. I'll look when it gets light to see how many hours it ran last night. I think small engines want an oil change every 25 hours or 50, so it's likely over due. I like Castrol GX, cause it's the one brand that quieted the rod knock in a truck, I used to have. Some engines have a low oil shut down DAMHIKT. That's how I got my first generator, relative ran one low oil. I'm trying not to let them know that was the only thing wrong with it. I added four ounces of oil, and it ran fine. Don't tell em, please. Best wishes on the manual. Hope they have good customer service. I would think the oil should be changed about once a year, but I agree an oil change isn't the issue. Or just replace it if it's 6+ years old. I think that's what I would do with a standby generator, as just normal PM. But again, since it starts and runs, that isn't the problem. It now has 540(point 0/10s) now, so, the power was out for four hours last night. I'm still on the line with Generac. They'll send me a manual by snail mail & email. That's a good point. I never *added* oil either! I'm still on the line with Generac support (they couldn't find the model at first). They're sending me "the manual", but I asked them whether it's 1. Owners Manual & Maintenance 2. Parts Manual 3. Wiring Diagram 4. Troubleshooting Guide 5. 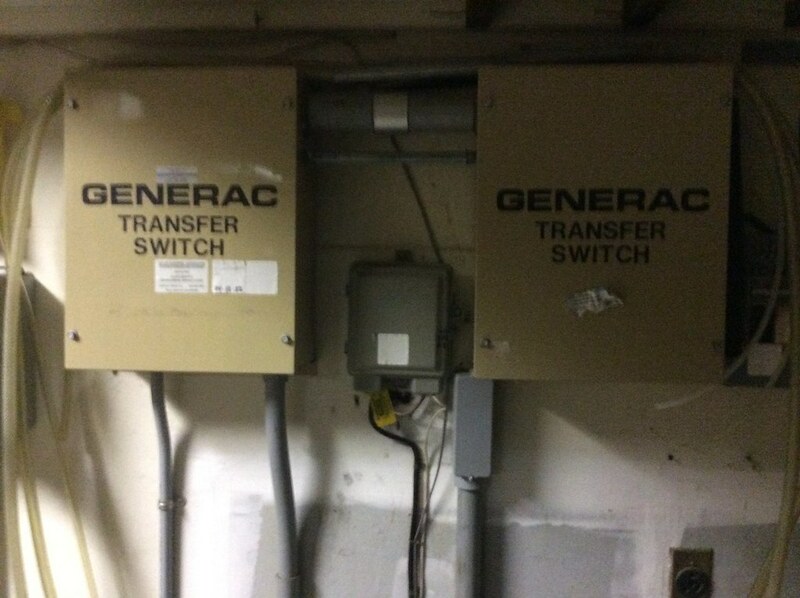 Service Manual And, whether it contains the transfer switch information. I like our different approaches. You're techie, and I'm nuts and bolts. Well, mostly bolts. I just listened to the 13 second 24MB video that the iPad created. It's a fast click. Loud and fast. Maybe 3 or 4 clicks a second. Rapid, then skips a click or two, then rapid again. Note: I'm not sure why a puny 13 second video is 25 MB. Since Flickr kept timing out on the 25MB 13-second iPad MOV, I converted it to a 500KB M4V using Handbrake on Linux. I wasn't sure what format to convert it to, but that seems to have uploaded to Flickr. Reading the manual, I see that the leading zero is what threw off the customer support lady (Rachell). The file is "9067-9.pdf" and it's called "Manual No. 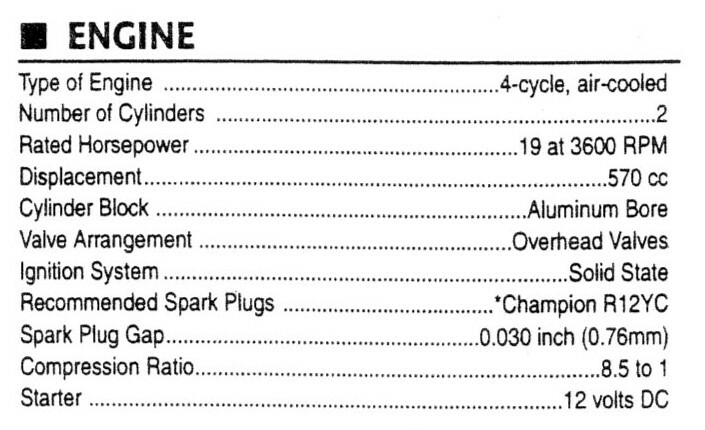 98374", titled "Generac II Emergency Power Systems Owner's Manual" "Revision 0 (11/22/95)". As you had accurately surmised, it has a low oil pressure switch cutoff at 8-12psi and and a high-oil temperature cutoff switch at 284 degrees F.
It's a 570cc engine of 19HP at 3,600RPM with a solid-state ignition, and Champion R12YC plugs. The oil filter is a Fram PH-3614, and it takes 1.5 US quarts of 10W30 motor oil. You were right that the oil should be changed every 50 hours, so, I have some 'splaining to do since I have never changed it. Obviously that's my first task of the day, after I pick up the filter. we make a good team. Wish I lived closer to you, love to visit some time. Anyhow, sounds like the machine can use some "routine" (cough, cough) maint. I know that my equipment doesn't get maint on proper intervals. Sigh. Anyhow, be interesting if this helps. can't hurt, of course. I'd expect to find the oil drain plug on the side, about half way back. Way down low. I'm guessing you'll take pictures and post? Danny, There is a forum devoted to Generac service and attended regularly by many Generac technicians. I am guessing you may have a leaking rubber bellows connecting the air filter chamber to the carburetor, a common problem, causing poor fuel/air ratio and rough starting and stalling, etc. Now, there's a nuts and bolts man. Much like the bad carb gaskets I've seen over the years. Get a Wix filter , they're the best in the business - Fram is crap . A bunch of the guys on the Sportster email list cut a bunch of filters up and analyzed the type/quantity/quality of the components . Wix came out on top , and I've never used anything else since . FWIW , NAPA Gold filters are made by Wix . Yes, we'd make a good team (I was always on sports as a kid and always a good team member). I sent the video to Generac support, but they (predictably) said they couldn't diagnose over email and offered to send me to an authorized dealer. Same with the oil, as the SAE340 grade doesn't exist either. Similarly, what the heck is an "oil makeup tank"? I suspect all three are mistakes - but - it's a bummer having to guess (I'm guessing RC12YC, SAE30, and that there is no such thing as an "oil makeup tank", which doesn't show on any of the exploded diagrams). That would be an oil holding tank that is in addition to whatever oil is in the engine crankcase. Some cars use that system, Harley's, etc.